I have always liked the look of this, although it is on the short side. David Payne: Payneyachts.com. Might suit your Aussie correspondents. He has other interesting rowing boat designs too. I like the look of the Pittwater Scull too. With its full decks and coaming, it should be able to take some choppy seas without that horrid damp feeling that you know is going to transfer to your car seat and be with you for days to come unless you change undies in public on the foreshore. A sliding rigger rather than the sliding seat would avoid the hobby-horsing that boats as short as that are prone to. But I am even more attracted to another boat in David Payne's range, the Greenwich Gig, which presses most of my buttons. 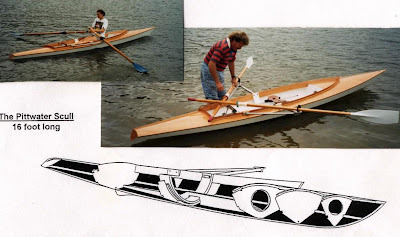 It should be very fast for a fixed seat boat - she is 18ft long by 4ft wide. She has a lovely wineglass transom which should mean the added weight of a cox will not slow her down too much. She also has a small sail for downwind work, and is very simple (no centreboard) and stable. The Pittwater scull is a great boat, it can handle some waves and choppy conditions so lets people get out rowing when there are powerboats around or the weather's a bit rough, when a normal scull is awkward to use. 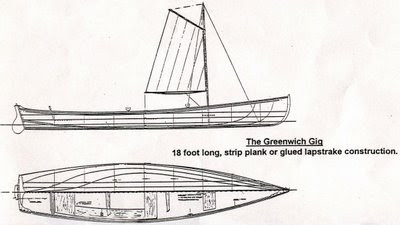 The Greenwich Gig is a good boat but I 've not had much feedback, more on the smaller version, the Rocks River Skiff. There is no centreboard, the sail is there for downwind conditions. I do not know how well it steers as I have had no comments back, but I do know the RR Skiff tracks well having rowed one, so I would anticipate the Gig to go well too.